So everything was running smoothly up until the point where I entered "heroku run rails db:migrate". Rather than getting the expected result, I got the following. 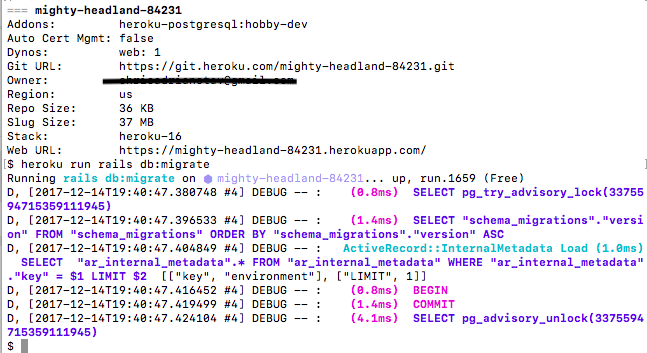 After getting that message, I typed heroku info and got the message above the migrate request. Hope that might have a clue to whats wrong. I cant quite figure this one out. Any suggestions? Hello @Christiantav, which section of the curriculum are you following Is this for the Installfest, the Intro to Rails, or some other curriculum? I don't know for sure what the issue is. It doesn't look like there was any error when running the migration. The output is debug information specific to the Postgres database Heroku uses. in your rails application directory? nothing to commit, working tree clean"
Thanks for the response, by the way! That status result is expected, so the issue is not a disparity between what was transmitted by git from your local machine to heroku. Does the installfest application work locally? do you see the output described at the end of Step 5 http://docs.railsbridge.org/installfest/create_a_rails_app? Hello. So I started the whole process of installing rails over again because localhost stopped working the second time I tried it, and it worked this time. Very strange, might have had something to do with the Gemfile. However, really appreciate your response, time, and support. Thank you! Glad to hear it. Sometimes the easiest way to figure out what's missing is to try and do something over from the start. I have a similar problem at the end, deploying to Heroku - I see the wee dancing people page, and on Heroku I can see the created apps, but they won't deploy. I've tried a few different version of the sqlite code as suggested on this site - I guess my question is, can I carry on with the Odin course and come back to this when I know more, or is there something intrinsically wrong with my set up which will cause disaster later on? Maybe I need to install postgresql on the old Mac?